This Ukrainian meat patties recipe or sichenyky can be made with a combination of ground meats or all ground pork. This is the Ukrainian version of a hamburger. The mixture is very moist to keep it tender. 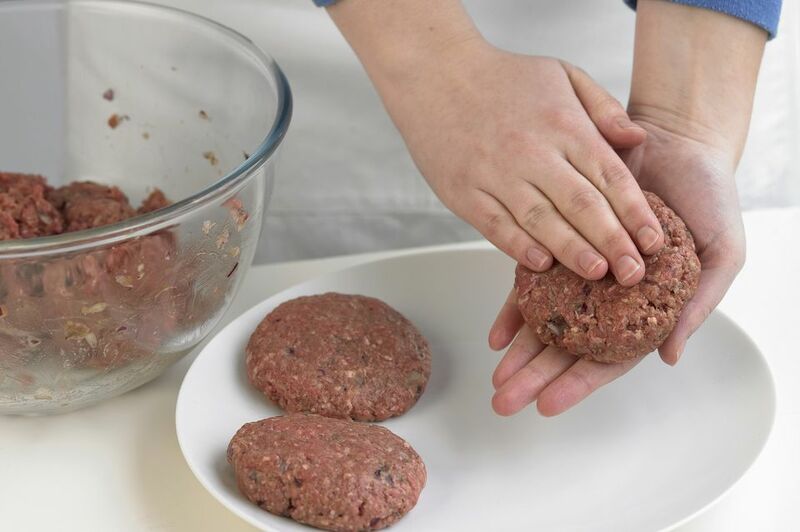 The patties are browned in a skillet and finished in the oven. In a large bowl, place 2/3 cup bread crumbs and pour the milk over. Mix and let crumbs absorb milk for 10 minutes (if too dry, add more milk). Add beef, pork, veal, onion, egg, salt, and pepper, mixing well. You may want to fry up a small patty to make sure you have added enough salt. Form meat mixture into flat patties and dredge both sides in bread crumbs. Let rest a few minutes. Heat a large skillet and add 1 tablespoon butter and 1 tablespoon oil. Fry patties in batches so as not to overcrowd, until golden brown on both sides. Add remaining butter and oil as necessary. Transfer meat patties to a baking sheet pan and finish in the oven for about 25 minutes or until completely done. Serve as is or topped with mushroom sauce and accompanied by a green vegetable such as Brussels sprouts. These patties are terrific the next day on rye bread.